While cleaning out our fridge during the pre-Easter Romanian cleaning frenzy, we found a huge bottle of pancake syrup that we had brought back from the US. It was unopened and while we like pancakes, we couldn’t foresee us eating 32 ounces of syrup in 4 months. Unless we became Will Ferrell in Elf. 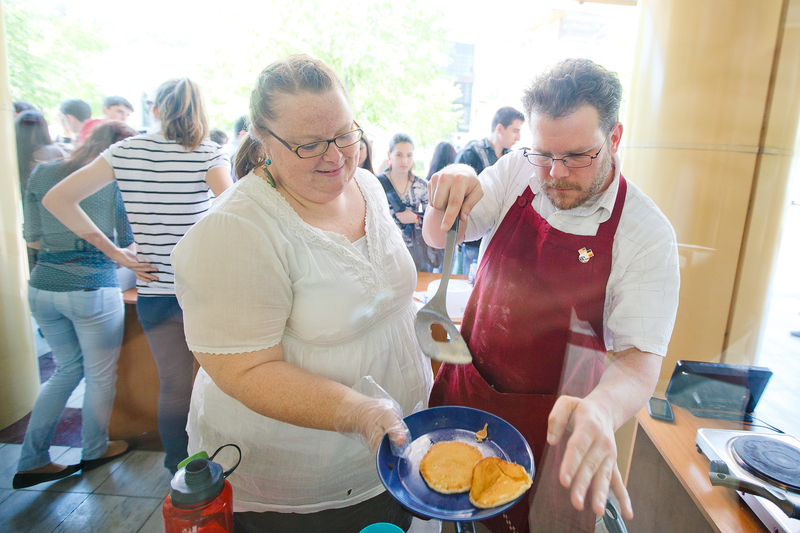 So we proposed a pancake fundraiser to our colleagues at the library. We’d recently been awarded $500 for a USAID/Peace Corps Small Project Assistance grant for a project to buy multimedia equipment for the foreign language section. But $500 doesn’t go very far for buying technology like tablets and mp4 players and such. 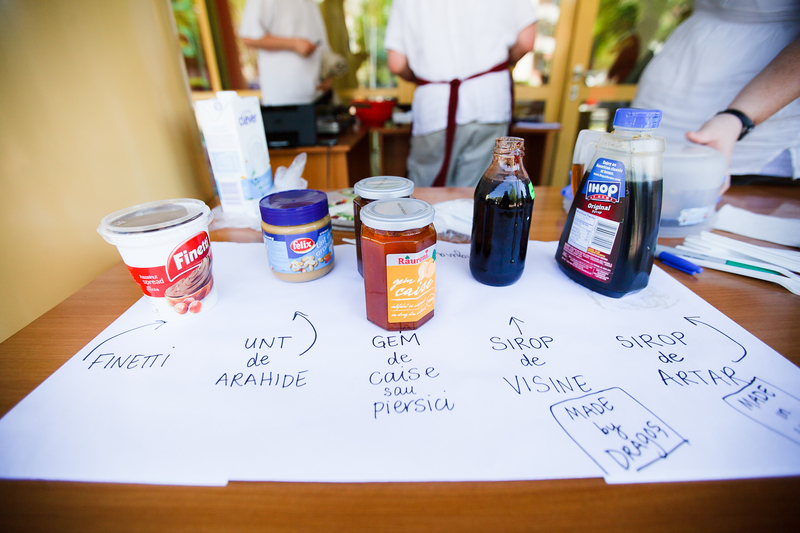 So a fundraiser would bring in more money to the project and use up our syrup: win, win. 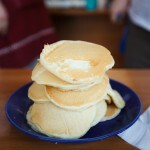 Fortunately our colleagues, Bogdan and Dragos, were up for the pancake fundraiser adventure. There was some general skepticism from people about whether it would be successful. But, as optimistic Americans, we moved forward, making posters, announcing the event via Facebook and trying to estimate ingredients. The day before the event, I got a call from a radio station. They wanted to interview me. As well, we found out that author and humorist Radu Paraschivescu had heard about the event and wanted to come as he is seeking stories of innovative programs at Romanian libraries. With the press knocking at our door, our worries about how many people would show up and whether we could keep up with demand mounted. But our worries were unfounded. 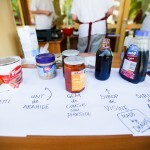 It was a super successful event with perfect weather and wonderful participants. We raised double the money we had hoped. 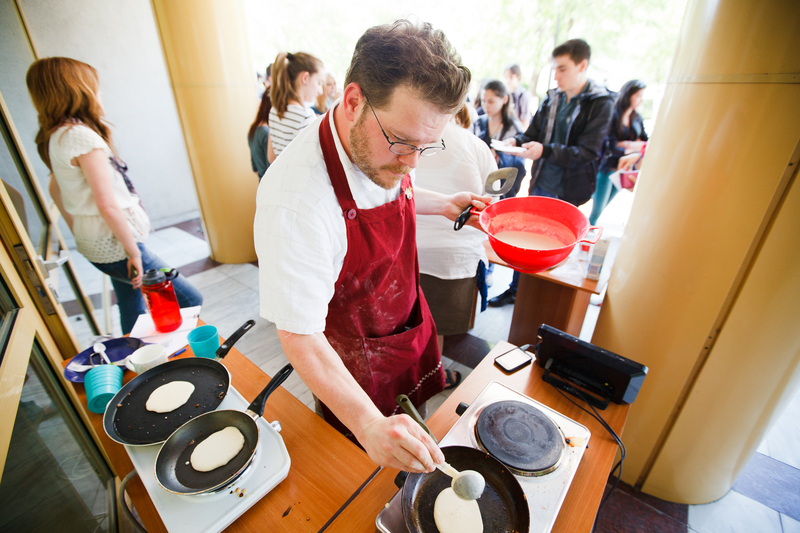 David, as the master of pancakes, was quite the hit as I think Romanians were fascinated to see my handsome husband in an apron making pancakes. While there were stressful moments, in general, it was a fun easy-going time. The stress mostly revolved around the tons of TV cameras and radio interviews we had to do in Romanian while making pancakes. 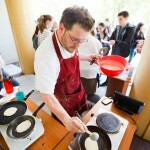 Here’s an article about the event with a photo of David cooking. Here’s a video from the TV station in Craiova about the event. ACK! I’m speaking Romanian in it. Finally, below is the article I wrote for Biblionet Program with photos taken by photographer Ovidiu Micsik. 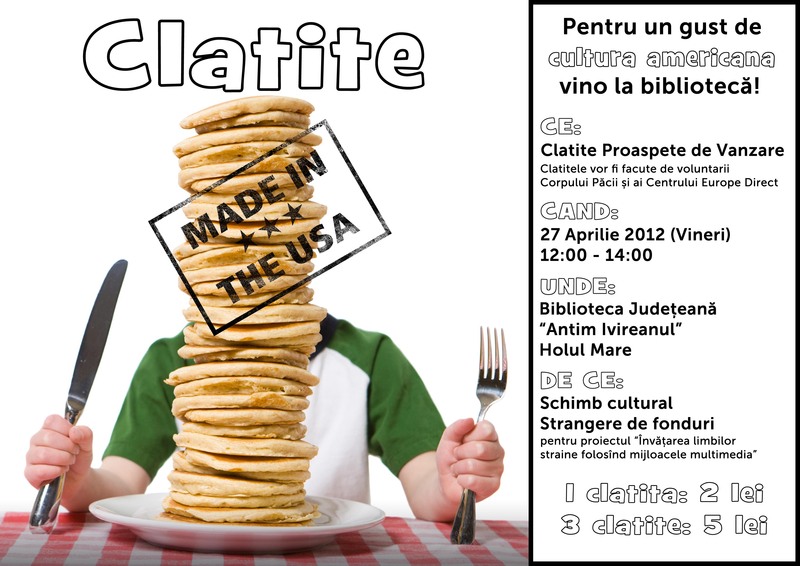 On Friday, April 27, 2012, library users at the Valcea County Library enjoyed their first taste of American pancakes and simultaneously supported a library project at the event entitled: Clatite: Made in the USA. American Peace Corps Volunteers with the Biblionet Program, David and Veronica Barker, with Biblionet trainers and librarians Dragos Marinoiu and Bogdan Dobre conceptualized this event to raise money for the project, “Multimedia Language Learning.” This project was awarded $500 of funding through Peace Corps’ Small Project Assistance Grant but the librarians and Volunteers believed that the Ramnicu Valcea community would support and contribute to the project if presented with a unique cultural event in which to participate. 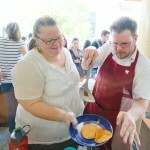 The local community did not disappoint; the fundraiser was an overwhelming success. 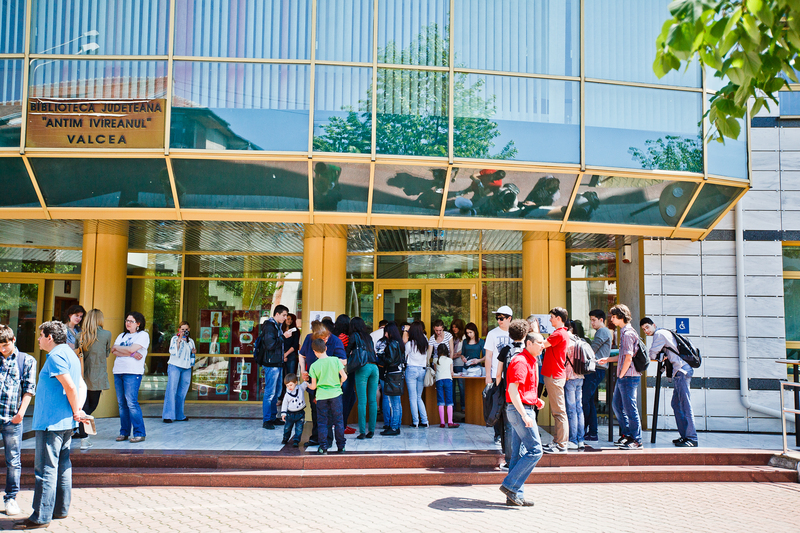 The event, situated in front of the library lasted three hours and attracted over 300 people, half of whom were adolescents. 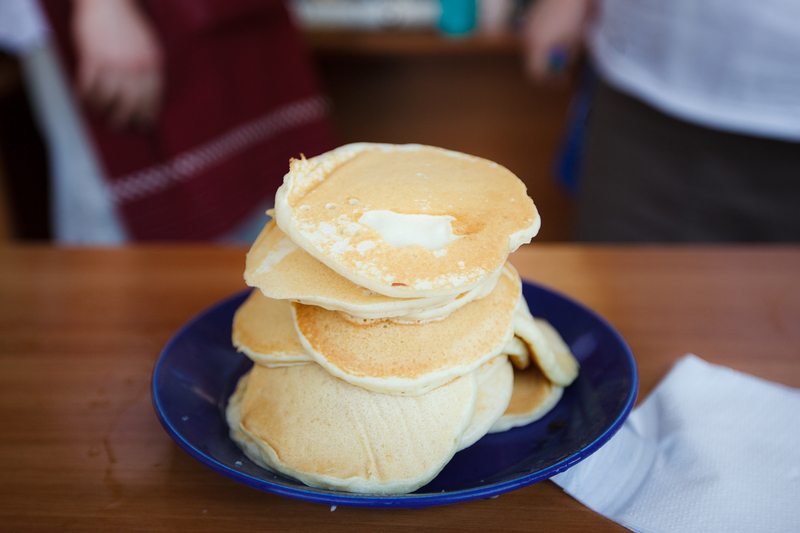 In this time, David and Veronica Barker made at least 250 fresh American pancakes. Volunteers from Europe Direct alongside American Exchange Students through the Rotary Club sold the pancakes to the crowds and raised over 600 RON (about $200). The overall reaction of library users and staff to the event was one of surprise. First of all, people were surprised at the tastiness of American pancakes and maple syrup which are quite different from traditional Romanian pancakes. Secondly, there was surprise at the number of people, particularly of youth who attended. Most libraries struggle to bring adolescents and teens into the library, but this event demonstrated that projects and events that are “outside the box” attract this demographic. The final surprise was the amount of money raised. 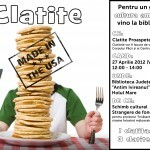 Fundraisers such as this, while relatively typical in the United States, are a new idea in Romania and there was some skepticism at whether such an event could be successful. However, with donations of ingredients from librarians, assistance from youth volunteers, and support from the community, this event was most definitely successful, raising enough money in three hours to purchase a tablet computer for the project. With the positive feedback and outcomes of this event, the project “Multimedia Language Learning” will move forward with more funds, community buy-in, and energy to support services in the Foreign Language Section of the Valcea County Library. At the end of the project, the Foreign Language Section will have multimedia equipment (tablet, MP4 players) filled with audio and video materials for foreign language learning. Additionally, the section will have comfortable and youth-friendly seating to attract more adolescent users. Finally, Volunteers and trainers will offer training sessions for fellow librarians, local teachers, and adolescent users on how to optimize foreign language learning using multimedia equipment. What an awesome article! So proud of the work you are doing in Romania — and looking forward to your return!